Provide comfort for the family of Paul Cain with a meaningful gesture of sympathy. 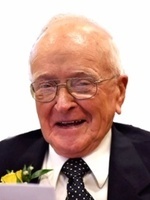 Paul Edward Cain, 90, went home to our Lord in Heaven and passed away peacefully with his family at his side on Wednesday, December 12, 2018 in Morgantown, WV. Paul was born on June 21, 1928 in Littleton, WV; son of the late Arley Spencer and Anna (Villers) Cain. He was a member of the Steelton Church of Christ, a retired millwright for PPG Industries for 40 years, served our country in the Army during the Korean War, member of the American Legion Post #28, attended Littleton High School and 1946 graduate of Hundred High School. He enjoyed spending time with his family, working in his garden, and raising blackberries. He was a lifelong and loyal Mountaineer, Pittsburgh Steelers and Pirates fan. He loved attending Magnolia High School sporting events to watch his children and grandchildren over the years. He also loved his good pal and faithful dog, Quincy. Survivors include his beloved wife of 62 years, Donna Jo (Bohrer) Cain, married on April 6, 1956; one sister, Laura Lee Aberegg of Hundred, WV; brother-in-law, Joe Parish of New Martinsville, WV; three sons, Don Cain of Proctor, WV, Dr. John Cain of New Martinsville, WV and Joe (Barbara) Cain of Proctor, WV; eight grandchildren, Justin Cain of New Martinsville, WV, Dr. Andrea Cain Rogers (Blaze Rogers) of Morgantown, WV, Lindsay Cain of Proctor, WV, Nick (Ashley) Goddard of Proctor, WV, Erin (Josh) Lemasters of Proctor, WV, Eliza Cain of Proctor, WV, Chase Cain of Morgantown, WV, and Grant Cain of New Martinsville, WV; and six great-grandchildren, Jaxson, Ava, Bowe, Lukus, Alyssa, and Raegan; and several nieces, nephews and cousins. In addition to his parents, he was preceded in death by his brother, Robert (Mary) Cain, and two sisters, Marie (Eddie) Roberts, and Helen Parish. Paul was many things to many people and led a life by example. He had several accomplishments in his life, but the ones he would be most proud of were his marriage to his wife, Donna Jo, his family, his faith, and his service to our country. He was a devout Christian, veteran, patriot, loyal friend, coworker, and above all, he was a beloved husband, father, grandfather, great-grandfather, and “Pop Pop” who will be deeply missed by all who knew him. Friends will be received 2-8 p.m., Saturday, December 15, 2018 at the Jarvis-Williams Funeral Home, 1224 S. Bridge St., New Martinsville, WV where service will be held 2 p.m., Sunday, December 16, 2018 with Ed Melott officiating. Burial in Greenlawn Memorial Park where the Honor Guard will conduct military rites. The family would like to thank everyone for their continued support of the Cain Family, and their love, thoughts, and prayers for Paul. Memorial contributions may be made, in Paul’s name, to the Paul Cain Memorial Scholarship which will be awarded to graduates of Magnolia High School for students wishing to pursue careers similar to his grandchildren; dentistry, education, nursing, engineering, cosmetology, research, military, and trade school. Gifts may be sent to Bayer Federal Credit Union or mailed to P.O Box 1220, New Martinsville, WV, 26155. To send flowers in memory of Paul Edward Cain, please visit our Heartfelt Sympathies Store. Charity Hatampa, DDS, George Bohrer family, and others have sent flowers to the family of Paul Edward Cain. Just a wonderful person. Dearly loved by so many. I am so sorry he has passed on. During my employment at the PPG cafeteria, I got to see Paul quite often. He was always kind and had a smile on his face. I would always blow my horn as I passed his house if he was out in the yard. He would always wave. What a kind man. It was a gift to know him. So sorry to hear of your family's loss. May you find comfort in your memories.